I often get asked HOW I created a 7 figure business after only 18 months of arriving alone, broke and homeless into a brand new country on the other side of the world. It wasn't luck. It wasn't any special 'gift'. It wasn't a serendipitous moment of epiphany. It was adopting some simple strategies and consistently implementing them - and in this course I share some of the easiest, simplest, cheapest (pretty much all free) and most impactful methods I used to quickly establish myself as a well-known leader and influencer in my industry sector. In this course, I will share with you some of the black and white, fluff-free, immediately implementable methods, tools, hacks and strategies that I used to succeed, that you can start using TODAY to make the exact same happen for you too. 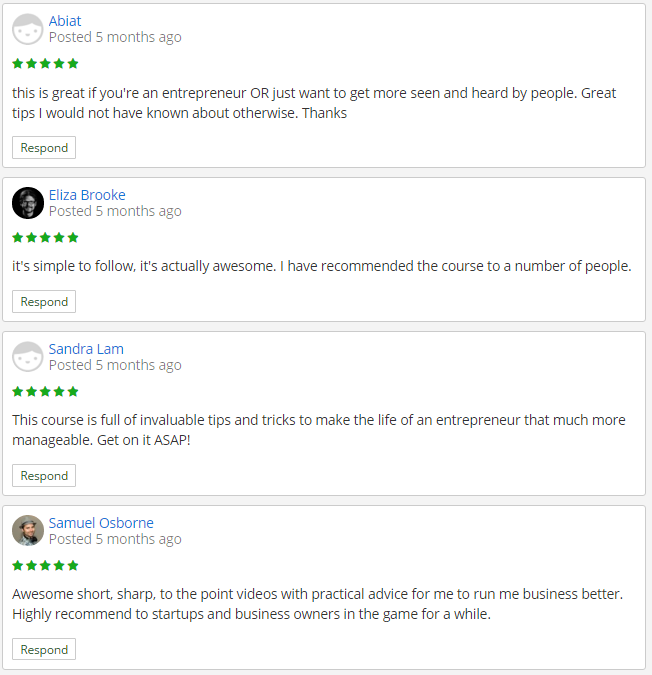 The tools, methods and strategies I will present to you in these 40 'how to' video tutorials are simple, free and applicable to absolutely any industry sector, and whether you're a well established business with a big team or a 'solopreneur' starting a business from your kitchen table. All up I have been in business for over 10 years in three different countries and I have learned a LOT on the way. I've learned from experiences good and bad, mentors good and bad; I have earned a lot of money and I've lost a lot of money. In this course, I will pass on to you some of the best, most transformative life/business changing methods that have HELPED me make it, so that you can get there the fast way without having to go through all of the lessons that I did to learn it in the first place. My passions are education and business, and in particular 'entrepreneurial alchemy', aka: making something profitable out of nothing. By putting this course together for you I get to fulfill my own life mission of creating entrepreneurial success stories across the globe as a result of my own spectacular journey in business. If you want to increase your earnings, get seen, heard and respected in your industry AND finally create for yourself the lifestyle of your dreams as a 'go-to' authority within your field, then this course is absolutely going to change your life, as learning them all has changed mine. I cannot wait to hear about your journey and success - let's get started!! What is 'authority positioning' and what will change? How To Get More Customers & Fans From Facebook - Without Paying A Thing! How To Get More Customers By Getting In front Of Them In Real Life! How To Put Your Task Management On Auto-Pilot! This course was so full of great tips and ideas that are not complicated. Heaps of information. Why not get this course for free as an 'Edupreneur Academy' member?